Ignorance is bliss. And my cable company is making sure I stay that way for the next couple of weeks. In a previous post, I wrote about watching scads of TV while my wife was away on a trip. I also made reference to Newton Minnow’s 1961 speech to the National Association of Broadcasters where he famously referred to television programming as a “vast wasteland.” Little did I actually know at the time that my own viewing choices at home were actually more than the basic options normally available to us. I had vast more wasteland than I was apparently aware of having. And with apologies to a certain Mr. Townshend, it continued to be a senior one at that. An error by our cable provider has resulted in an array of premium channels becoming accessible on our cable box without our actually paying for them. Instead of the really bad movies and shows that I’ve been watching on run-of-the-mill basic cable networks, I could have instead been enjoying equally inferior entertainment on prime channels such as HBO or Showtime. 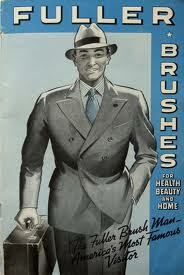 Opportunity came-a-knockin’ but I mistook it for the Fuller Brush man and shut off the lights and closed the blinds. At the top of this post is the official announcement that Comcast sent out to inform us of a mistake they made on our account. Its pithy style, so unlike the normally expressive circulars I’m used to seeing from them, gave me a few grins. I have to wonder about the number of drafts this letter may have gone through at Corporate before ultimately being given the final stamp of approval to send out to customers (“For God sakes, Hampton, I told you to keep it vague!”). But, yes, a cable company did in fact admit to an error. Sort of. 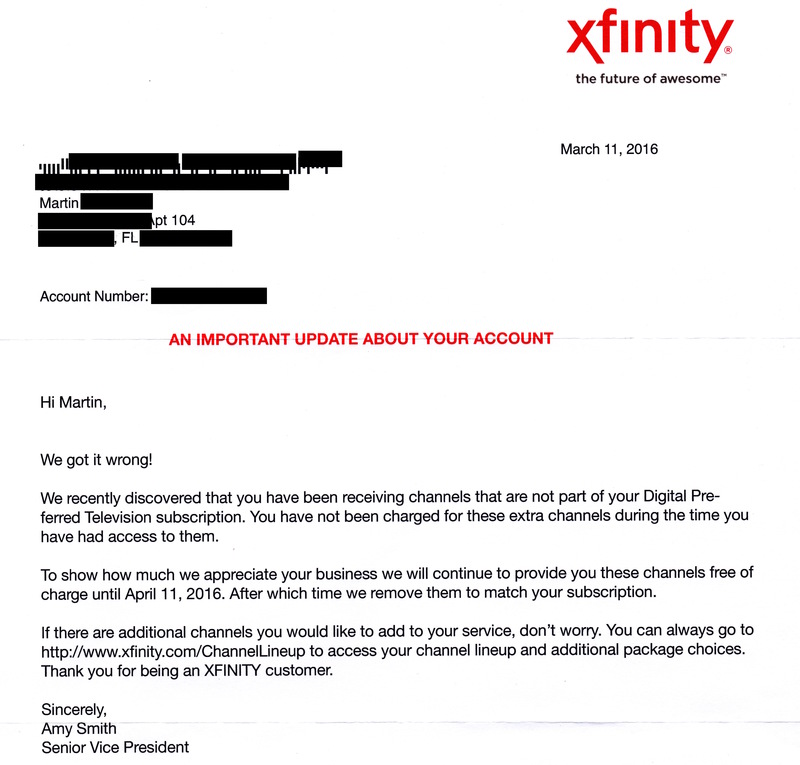 What I love about this letter from Comcast’s Senior Vice President is that she never actually reveals two semi-important things: (a) exactly what channels I’ve been receiving by mistake, and (2) for how long?¹ Yes, the same industry that will never tell you precisely what time they’ll arrive at your home is nothing but consistent. That’s for them to know, and you to find out. Still, giving customers new channels without even bothering to tell them? Splendidly unique. 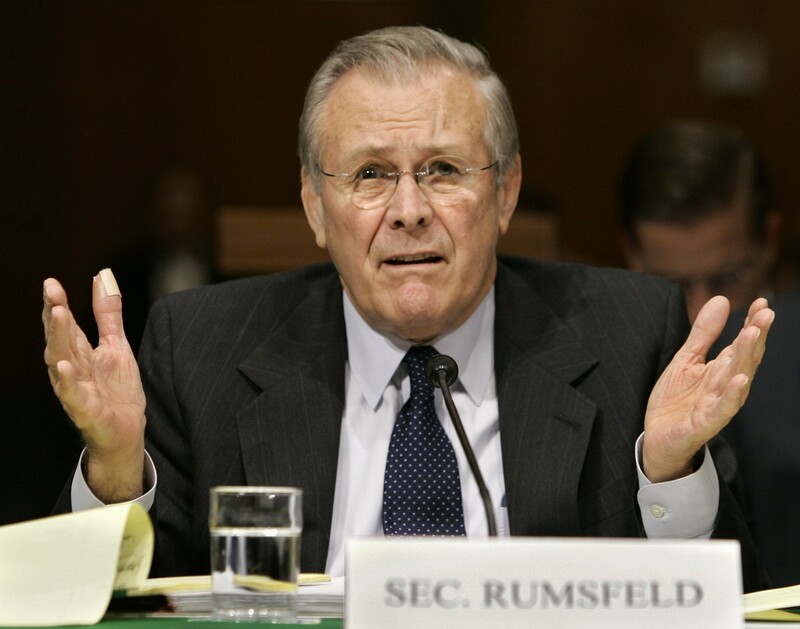 Perhaps they are now, ‘er, subscribing, to that famous Rumsfeldian condition popularly referred to as Known Unknowns. Of course, it’s absolutely appropriate of the cable company to mess with my head. This is a business that never fails to bewilder me with its complicated pricing and content. Just like the airlines, I’m pretty sure even their corporate by-laws require total obfuscation when communicating with customers. And generally we all do collectively tend to enable this type of behavior. Consumers seem to accept rhetorical dances with service companies; ones that sashay in and around the gray areas of truth and outright deception. It runs in parallel to the same kind of beguilement entrenched in our leaders and institutions too. We hear lofty and sincere platitudes, but in fact each party knows otherwise. Yeah, yeah, yeah, got it. So where do I sign? If it wasn’t so frustrating, the cable company’s practices can offer a little comic relief. For instance, there’s the sheer number of useless channels they give us. I probably watch only a very small fraction of them, yet I have to scroll through so many, searching in vain for that one time I really just want to watch Sports Center. For years consumers groups and Congress have demanded the ability for customers to select only the channels they want. Cable providers, however, have successfully pushed hard against it. There’s just too much money at stake. Seriously, Marsha, I’ll do anything you ask if you can just fix the problem. Yes, I’ll hold. Namaste. As a matter of full disclosure, I never even bothered to try and find out which channels I’m temporarily getting for free. While film and TV bloggers like JustMeMike regularly entice me with reviews of shows from HBO and other premium cable channels (fyi, his recent review of “Vinyl” is worth reading), I nearly always end up either purchasing used DVD’s or borrowing them from the public library. It’s hard enough for me to find the time to stay current with my favorite sitcoms and dramas on regular network television. 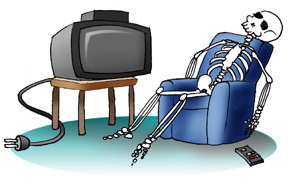 Watching premium channels too would make me feel too much like a couch potato. So first I wait to see what all the buzz is about, and then I’ll binge watch at some point during the summer months. I am fully aware of the cord-cutting trend of millennials and others who eschew the high cost of cable and satellite providers. I have friends, fellow seniors in fact, who have figured out how to get around the system by buying Apple TV and subscribe to Netflix instead (Hi, N.). I’m told the savings are worth it but for a few snags in finding local stations. For now, though, I remain a basic cable subscriber due to a package that is offered to all residents at the retirement community where we currently live. Our cost is further lowered because of a <brace yourself for a marketing term> bundling of a land line we have for Gorgeous’ business and our Internet service. Our accountant has the chore of separating church and state between the business and personal parts of this arrangement. So between now and April 11th feel free to come over and watch some premium channels with me. Hell, I think that 12 pack of Michelob is still in the fridge. I am nothing if not benevolent. ¹ For those who remember the character Paul Buchman on “Mad About You,” this sentence structure was designed especially for you! We recently cut off our telephone landline and “packaged” it with our cable. We are saving money by doing that but I’m still not happy that I get many channels in languages I don’t understand. I’d like to buy a 10 pack of stations or maybe a Baker’s dozen. That would be more than enough wasteland for me! When I call and get somebody from India, I ask to speak with an American. They are required by law to do that. Your description of the channels is fun. I get TONS of channels….in Spanish or on the regular ones that show the same thing…..every single night! LOL. Yeah, it’s always a crapshoot. I usually hang in there with the foreign call centers because honestly I feel as if they try really hard to help. But the language issue can be overwhelming sometimes. Hi Snakes – thanks for the plug. I shall soon be having another dance macabre with my cable TV outfit. That will be about the time I approach them in their spanking new facility on University Parkway. I was there today to pay my bill which this month was 202.10. They have some who opens the front door for you. Welcome to XFinity. What will you be doing this morning which is an easier way of saying what do you need. I pointed at the bill paying kiosk and said simply – I’m paying my bill. But at some point in the near future (not today but before April is over) I will be closing the account. I’m moving to a different state. But back to the issue. Almost a year ago I was paying a bill at the old office. I had to deal with a customer service rep because the bill paying kiosk machine was down. Hi there I said. I’d like discuss lowering my bill. She was more than pleased to offer a new bundle that included a home security thingy. With this promotion, bundled with my Cable TV, internet, and land line phone, this new package will save you about $50 or more a month. But I don’t need a home security system. My apartment is already wired into one via the apt complex. Well you don’t have to use it she said. So I said show me the figures. What she didn’t say and what I didn’t ask was the fact that I was signing on for a new two year deal. Yes I saved between 50 and 60 a month – but only for six months. And then the price reverted to what is was previously. The home security system arrived a few days later and is still in the box it came in unopened. I happened to call them recently because the streaming (Of Netflix or Amazon Prime videos) would work fine for a while and then suddenly cut out, and I’d get an onscreen message saying. You don’t have enough band width. Well the dude was able to tweak that for me – and it has worked fine since. But it also means that they had me set up for lower bandwidth than I was supposed to have and had been paying for. I also found out that I will have to pay for the unused portion of the two year deal at a rate of $10 a month. But I will be happy to break the contract. Keep up the fine work on your blog Snakes – love reading your stuff. You had me at “What will you be doing this morning ” when you were greeted at the door. Oh, the euphemisms used by business now. Wow, so seriously, you actually got the security system in order to get a full package. Kind of like booking a motel on one of those travel sites to save on a round-trip ticket cost and never staying there. That’s pretty funny when you consider this was all for the getting the TV package you needed. Good luck with closing out that account and settling your other affairs before you move. I already had the desired package with a few add-on premium channels and a higher internet speed. I was just looking for a reduction in my cost. I’d complained before and was directed to the loyalty program dept and had received a substantial savings for 6 months. If I had cable, I would only want Investigation Discovery. Last time I was home, that’s all I watched. Yes, the euphemisms are odd. I called a company and they said “Welcome to…” What an odd way to greet someone over the phone. Good luck with the stations you get to keep. “Welcome to…” I love it. Like you’re at a restaurant. Hey, you’ve just given me an idea for a posting– insincere and nonsensical automated greetings when calling companies! We recently got Roku so we could stream some shows (don’t we sound all modern?). We intended to ditch our cable but couldn’t figure out how to get the local channels. What we really need is a 14 year old to explain it all to us. Too funny that they didn’t tell you which channels you were getting for free… I would assume they’d want you to know so you could watch them and presumably decide you couldn’t live without them. Wow, I’ve never even heard of Roku. If you find that 14 year old, please send him/her my way afterwards. I’m hoping someday to cut the cord mainly because I resent the high cost of everything. If it wasn’t that we could deduct at least half of it for my wife’s business I think we’d have gone for another solution by now. As far as I can tell, out of our 200+ channels on DirectTV, 75% of them are like QVC channels trying to sell you junk, 20% are pay per view channels and only 5% are “real” channels. We just switched to DirectTV six months ago because they were cheaper than AT&T even though they are owned by AT&T. Now you figure that one out… Doesn’t that seem a bit incestuous? We’ve talked about unplugging, but I’m not sure my husband could survive. It is amazing how many actually are shopping channels. And even the regular ones are sort of funny — like how many Lifetime channels to women really need? Of course, I think the same thing about the number of Golf and fishing channels too. Truth to tell, I’m not sure I could survive without it all either. I like to make fun of it all, but honestly binge-watching Hogan’s Heroes or All In the Family reruns is like having Oreos and milk at 2:00am for me. We all have our secrets.